BERKELEY, Calif. (CN) — A pack of masked, black-clad anarchists attacked a small group of pro-Trump demonstrators during a right-wing rally in Berkeley on Sunday. 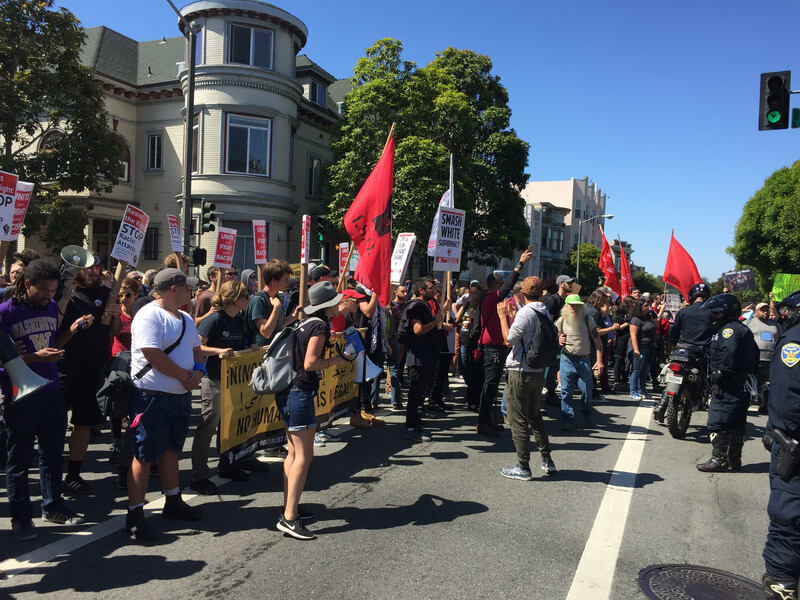 Counter-protests against right-wing rallies in San Francisco and Berkeley over the weekend remained largely peaceful until Sunday, when the mob of masked agitators stormed into Berkeley’s Civic Center Park to disrupt a “No Marxism in Berkeley” event. The aggressors chased off right-wing activists, attacked one with pepper spray, and ganged up on another, pummeling him with fists and sticks. The masked assailants attacked journalists that tried to document their actions, according to the San Francisco Chronicle. About 400 officers had placed barricades around the park and screened everyone entering the area for weapons. But police stepped aside when hundreds of masked aggressors outnumbering them surrounded the park and stormed inside. One officer and six others were injured; two people were taken to hospital. Police said they arrested 13 people on various charges, including assault with a deadly weapon. The violence in Berkeley on Sunday stood in stark contrast to the peaceful counter demonstrations in San Francisco on Saturday. “Patriot Prayer” organizer Joey Gibson canceled the event planned for San Francisco, blaming Mayor Ed Lee and House Minority Leader Nancy Pelosi for provoking hostility against him and his fellow right-wing activists. 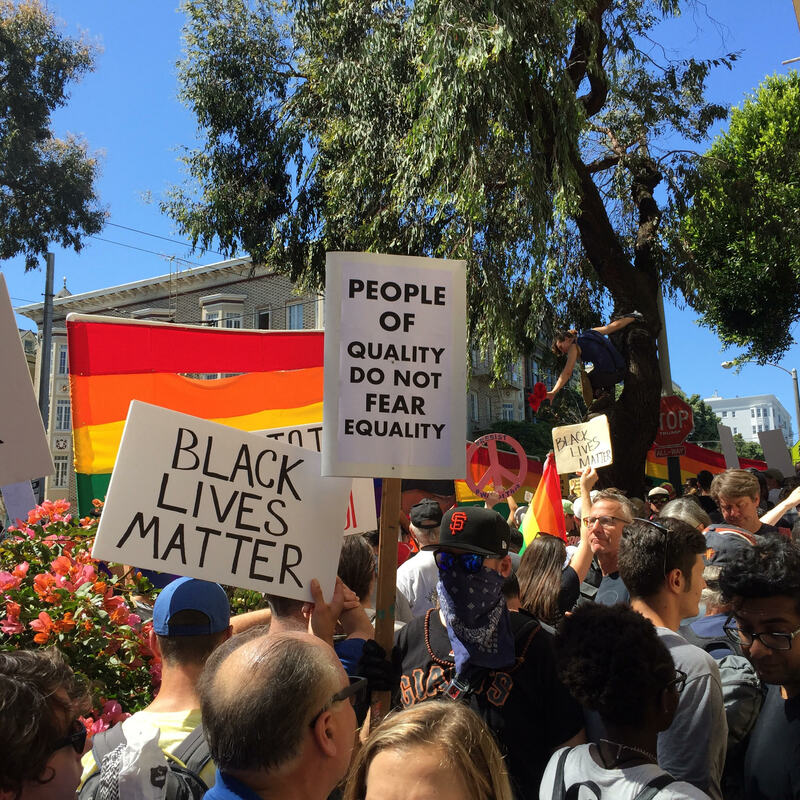 Hundreds of anti-hate protesters showed up to Alamo Square in the city’s Western Addition neighborhood, where Gibson had planned to hold an impromptu news conference in lieu of the planned rally. But officers had fenced off the park by early Saturday morning. 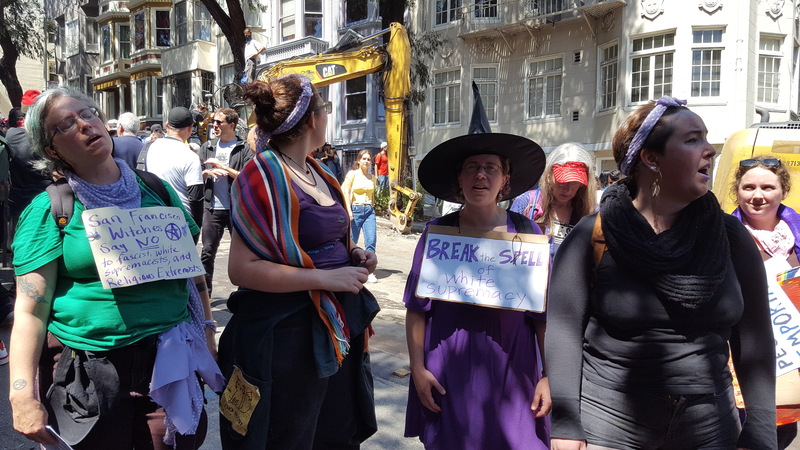 On Hayes Street near Alamo Square park, people handed out free cups of water, pastries and flowers to fellow demonstrators, in San Francisco-style. “It’s the least I can do,” said Chandra, a 40-year-old Hayes Street resident who lives near the park and was handing out cups of water to anti-hate demonstrators on a hot and sunny San Francisco day. Sporting heart-shaped glasses reminiscent of the Summer of Love, 32-year-old Shannon Bolt doled out orange and white “flowers against fascism” to protesters and passersby. The flowers send a message of love and positivity to counter the hateful rhetoric of right-wing groups, Bolt said. She said those groups try to mask their bigotry and intolerance behind a banner of free speech. Christal, a 56-year-old San Franciscan, said she thinks Gibson tried to hold his impromptu news conference at Alamo Square because it is in a historically African American neighborhood. She said Gibson and other right-wingers try to paint themselves as victims even as they spread propaganda that victimizes minority groups. She argued that hate speech should be more restricted in the United States, as it is in Germany. Genocides in Rwanda and the former Yugoslavia started with “talking that dehumanizes people,” she said. Gibson abruptly canceled the San Francisco rally, originally permitted to be held at Crissy Field near the Golden Gate Bridge. On his Facebook page, Gibson called the Crissy Field event “100% a setup.” He later said in a Facebook video that he feared the way officials had organized the event would cause a “huge riot” and clash between his groups and Antifa, or anti-fascist protesters. Gibson, who attended the Berkeley demonstration Sunday, was seen on video running away from a mob and being attacked with orange pepper spray. “Yesterday, we showed to the world that love conquers hate. #SF was a city of peace and unity,” Lee tweeted Sunday. Berkeley police have asked the public to send in photos and videos of the chaotic Sunday event to help them identify people who committed crimes and engaged in violence.